First stop was at the newest of the sheep bridges over Camas Creek near Fairfield. 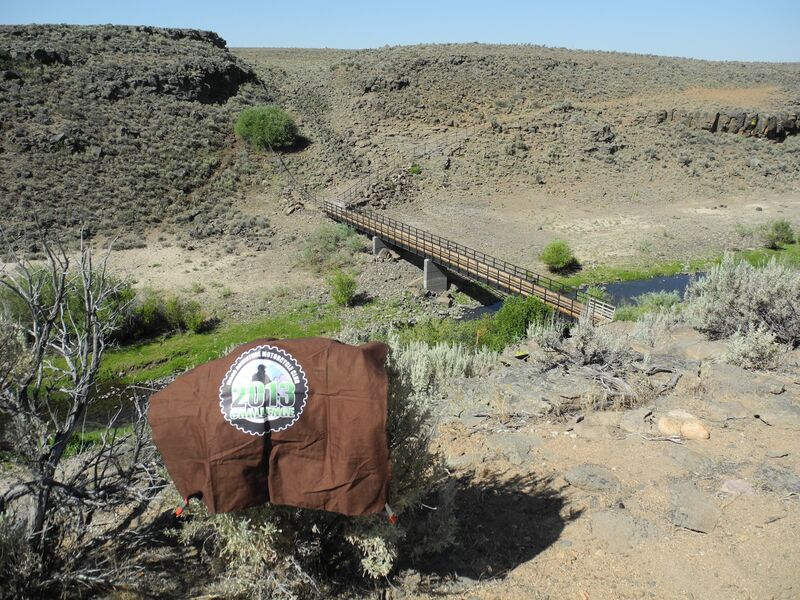 The original sheep bridge and official Challenge site over the Wood River would have to wait for another trip. This bridge would definitely be ridable but access was possible only for the sheep. 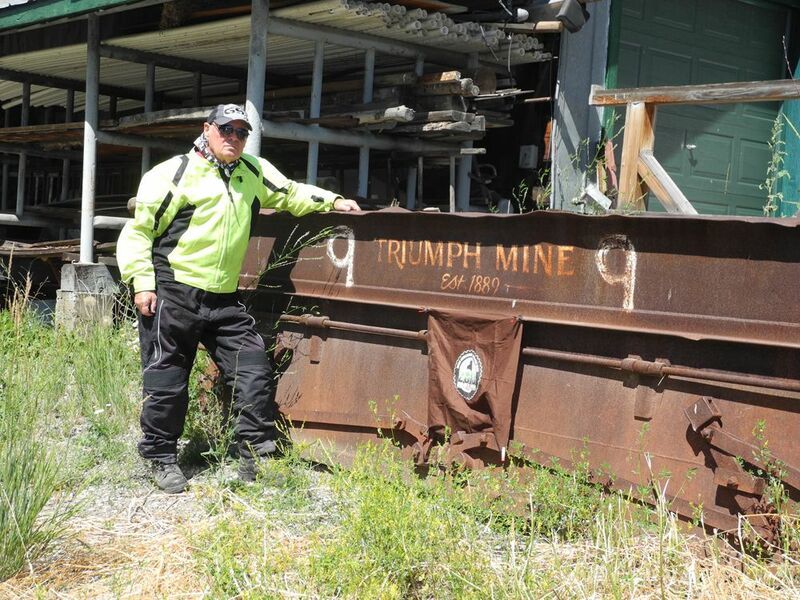 Adding to the traffic congestion at Ketchum were construction delays so the Triumph site (#37) was a welcome break. Over Galena Summit, elev. 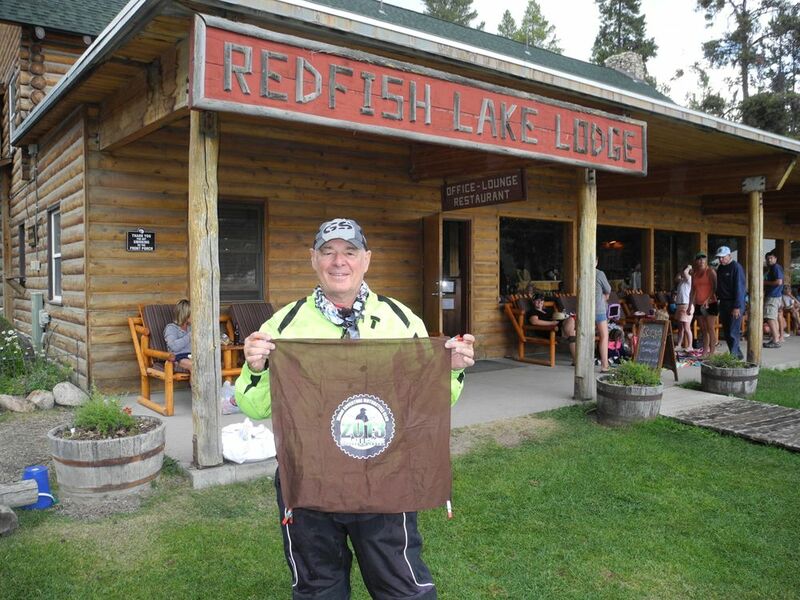 7,300', and down to Pole Creek Station (#21), the weather was turning dark and windy just as Idaho's chief meteorologist had predicted. At Redfish Lodge (#22) the site pic was helped by an obliging tourist and I pressed on trying to stay ahead of the darkening southwestern sky. I somehow managed to avoid the raindrops but fought a terrific wind in the Salmon River canyon which came at me from all different directions. As I approached Salmon, Idaho it was apparant that I had dodged a hale storm as the streets were littered with leaves stripped from trees and small piles of marble sized hale still lay in the gutters. The "No Vacancy" signs were all out so I camped out but next morning it seemed to take hours to dry the tent. After an amazingly good breakfast the bright sun warmed the way as I rolled on to ID28 for the glorious ride to Tendoy. 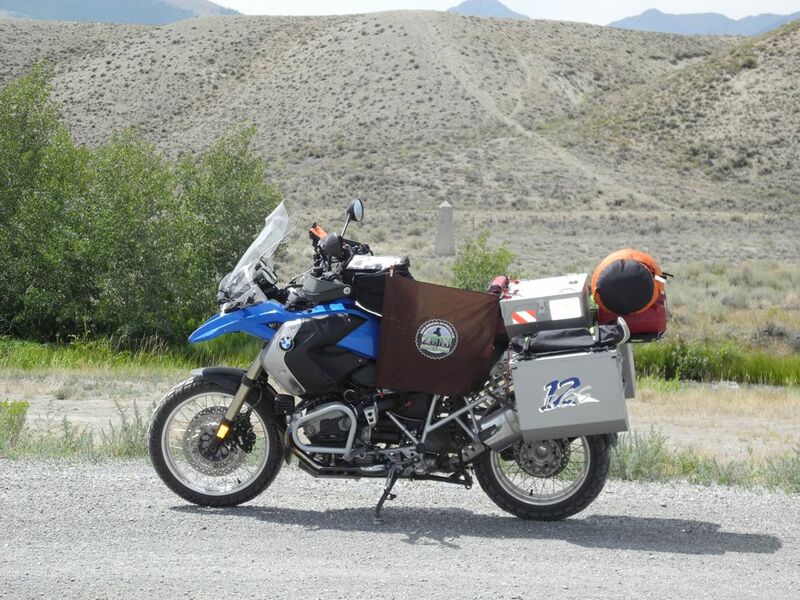 The ride up to Lemhi Pass, elev. 7,373' was a highlight of the trip and well worth the effort. A great view of Lem Peak, elev. 10,985', from there. Further southeast on ID28 over Gilmore Pass, elev. 7,150', (don't blink, you'll miss it.) and following the GPS put us close to the Birch Creek "Incident" site (#9). 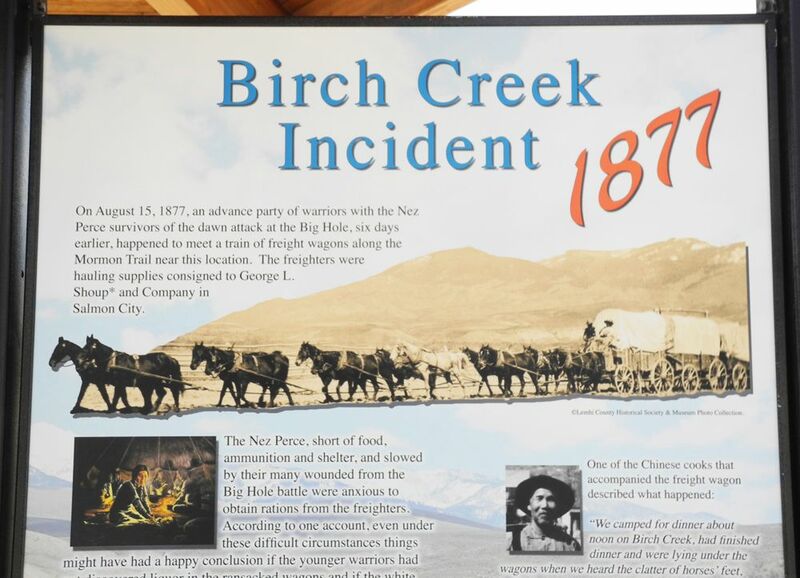 There was some discussion about the exact point that the "Incident" occurred but some of us clubbers decided the stone monument across birch Creek must be it though the information kiosk is closer to the highway. The 1877 freighters made the mistake of having whiskey in their stores and some were murdered for it. 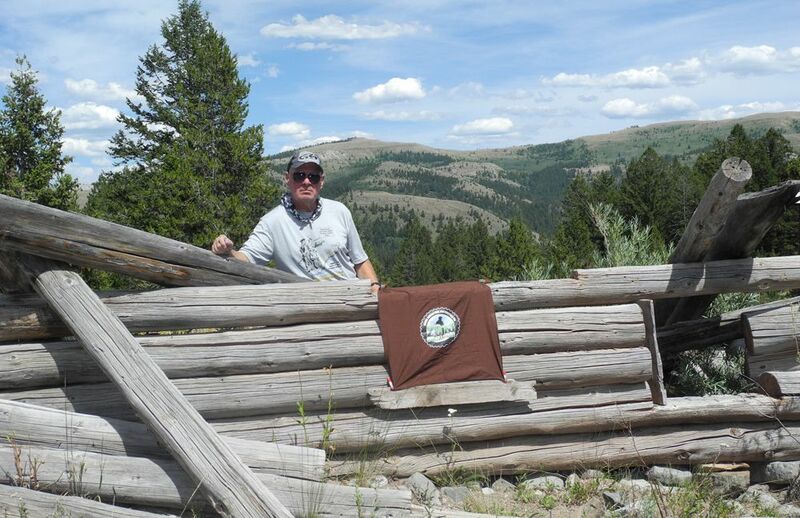 Heidi takes a well deserved break near the "incident" marker close to fishing mecca Birch Creek. 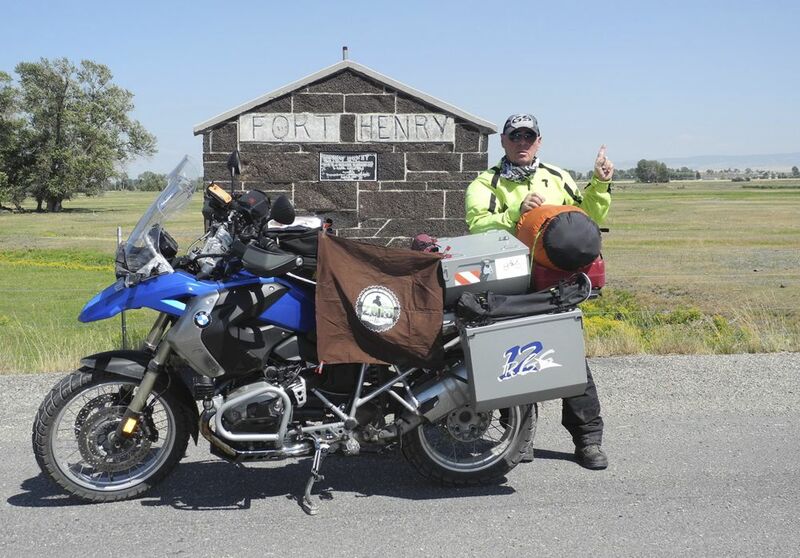 After a wind blown right-leaning angled decent into Mud Lake I stopped in Rexburg for a well earned cheeseburger then forged on to the Fort Henry site (#11) via Salem Road. The fort was actually six miles from the markers location . 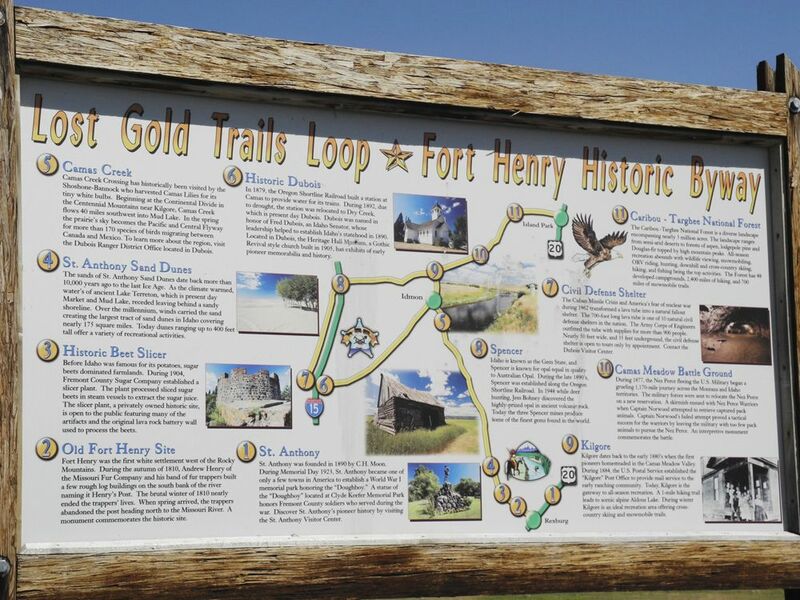 ...a map with informative list of attractions on The Lost Gold Trails Loop and Fort Henry Scenic Byway. Good stuff. 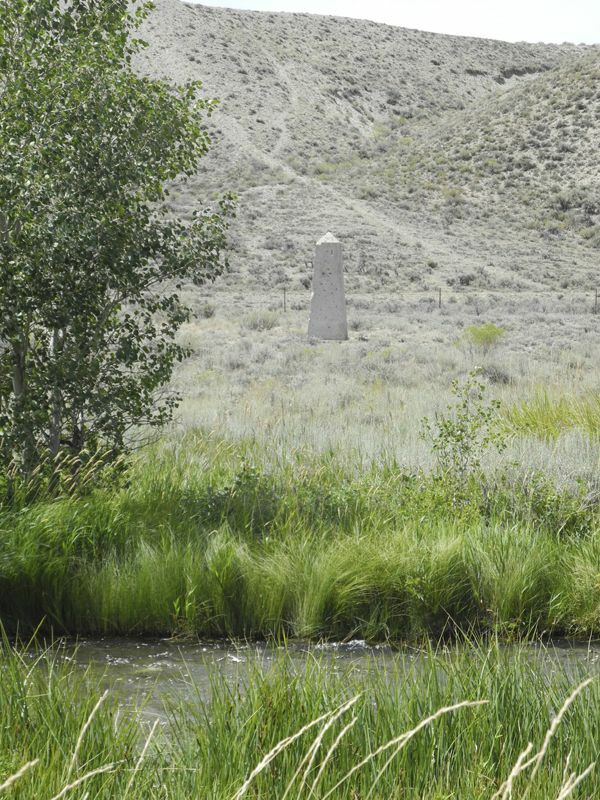 Traveling north and east on Red Road past Kilgore is the Camas Meadow Battle Marker site (#1) where Howard's camp was raided by Nez Perce and their mules stolen. 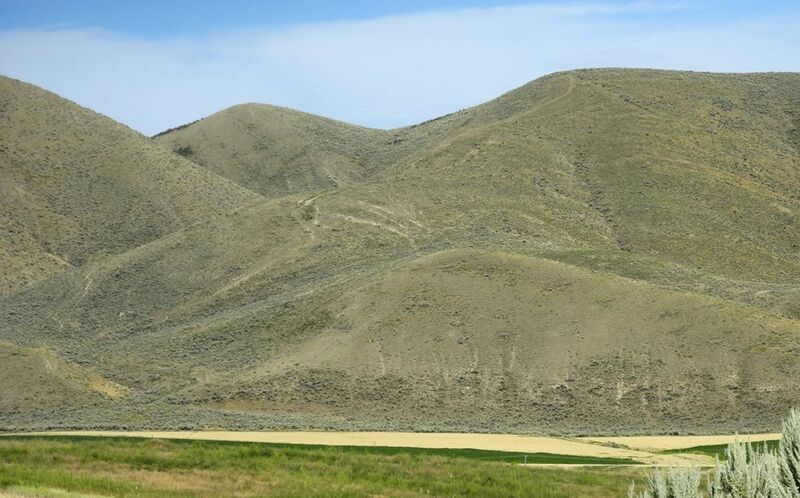 The scenery in this part of Idaho is spectacular and comes highly recommended. Though there were no Challenge sites to be had in Wyoming I have long wished to ride the Park's Northeast Entrance road, Beartooth Pass and Dead Indian Pass. Being this close I headed east to West Yellowstone. 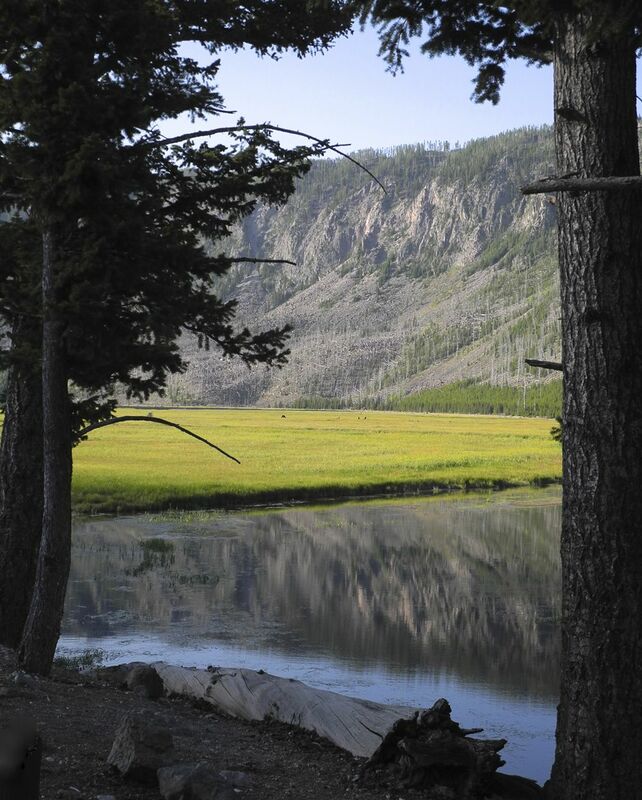 I decided to credit card camp near West Yellowstone but that great bed, shower and cable didn't come cheaply. The sunrise through my window the next morning was priceless though and after a motel muffin and bad cuppa I entered the park. Though the elk were thick I didn't have a long telephoto and didn't care to stop in traffic jams to attempt a closer look. This is the best elk image I could manage. 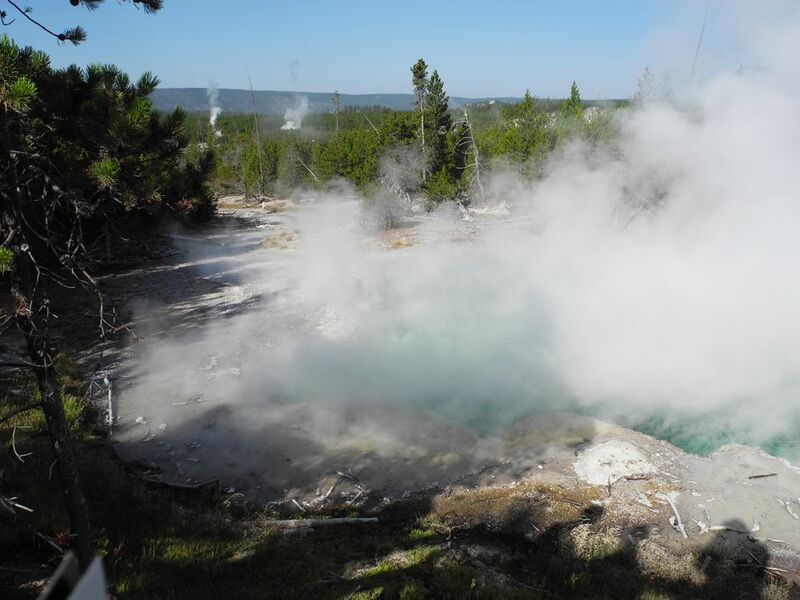 The Norris Geyser Basin was my next stop. 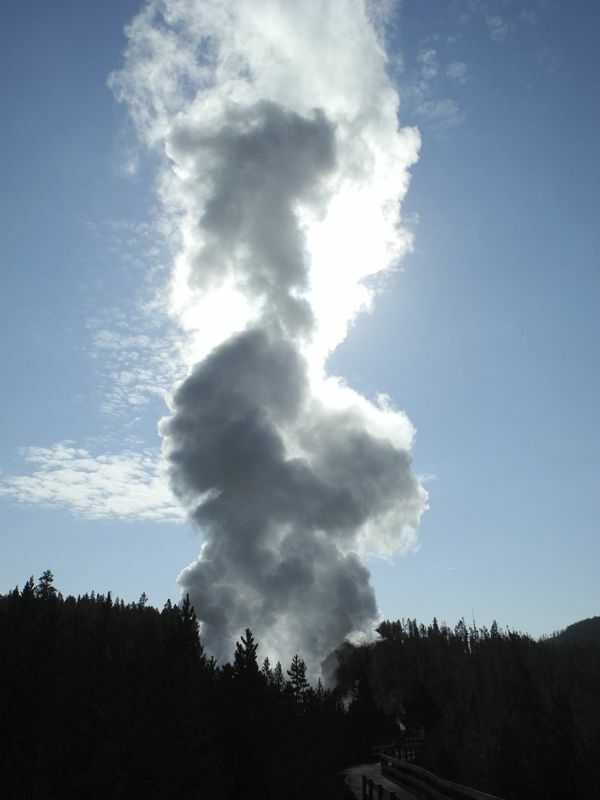 I parked and stretched the legs on the boardwalk passing sulphorus steamy emerald pools to resting geysers billowing 200 foot clouds of super heated steam. 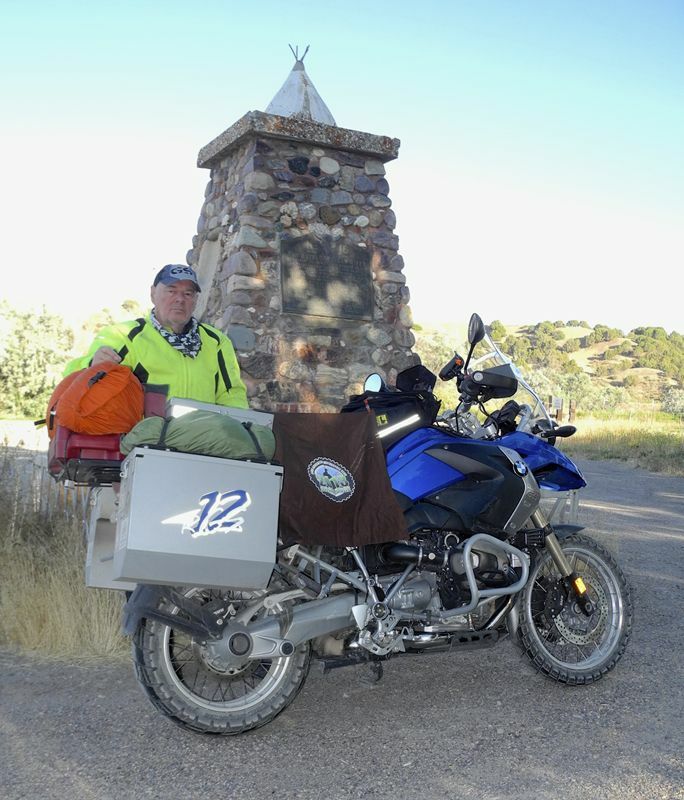 A stop near the summit of Mount Washburn, elev. 10,243', and a panorama of Washburn Hot Springs. 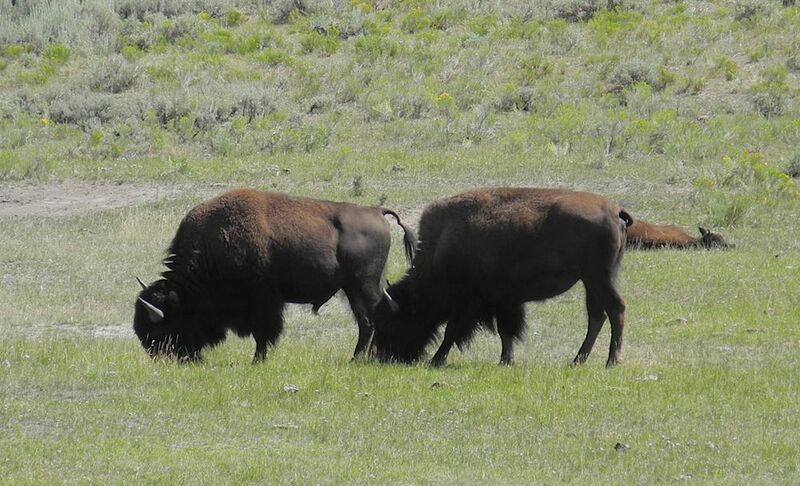 The bison were out in rare form, but their disregard of motorized vehicles and legendary hostility toward the two wheeled variety kept me in the saddle and ready to make a hasty escape if needed. 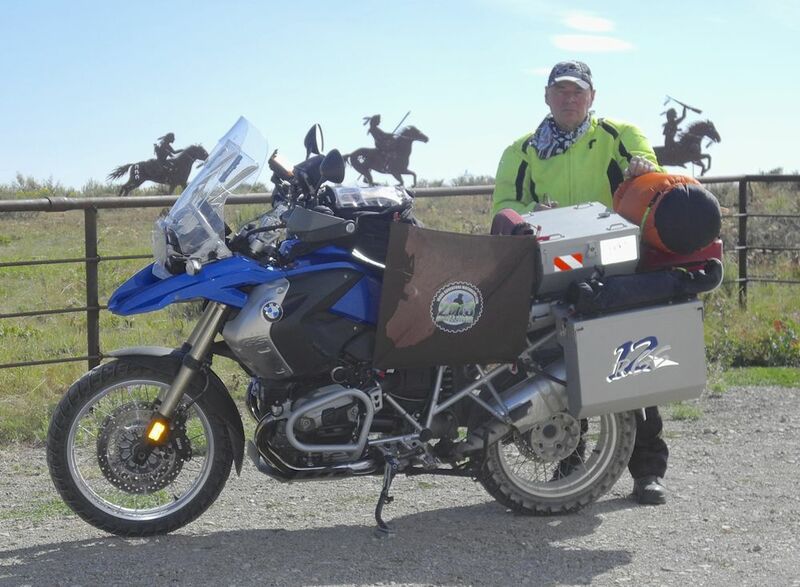 Once out of the park Heidi and I merged onto US212 past Cooke City, Montana, then back into Wyoming toward Beartooth. There was road construction in the high meadows, no surprise that it's a challenge keeping asphalt together in this elevated environment. 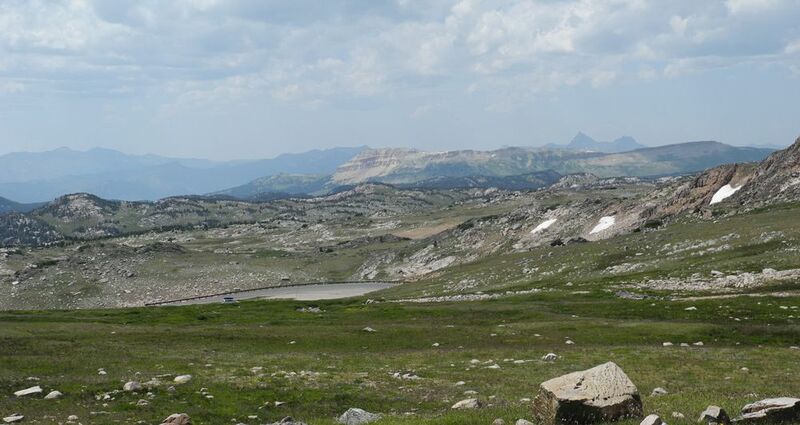 This panorama was made at Beartooth Pass, elev. 10,947', top of the world and no country for the faint of heart. Christmas Lake sits beneath the summit on the southern exposure. Twin Lakes hold the eye in this panorama with the Montana state line just beyond. 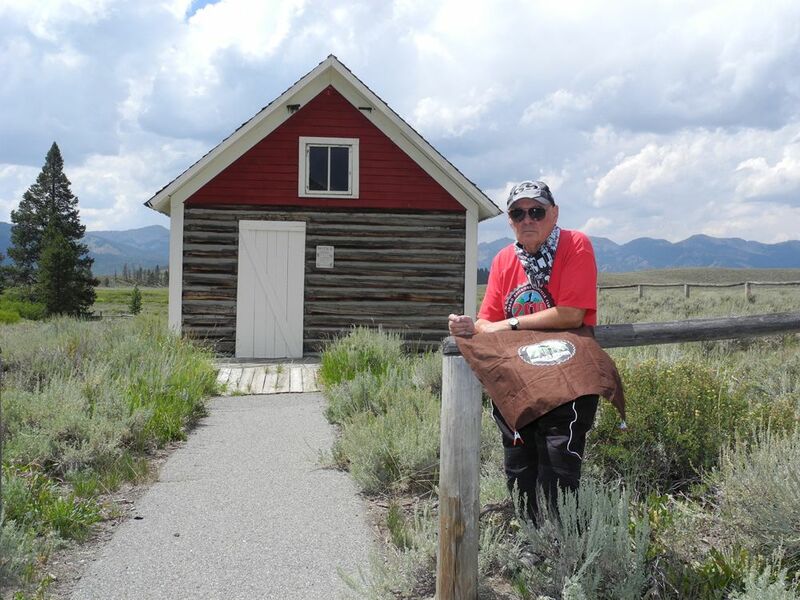 I rode on to Red Lodge, Montana for fuel and snacks then headed back up over the pass toward Wyoming's Chief Joseph Highway. Though the river can't be seen the canyon of the Clark Fork of the Yellowstone River can be photographed while standing on the bridge over Sunlight Creek. This view from Dead Indian Pass, elev. 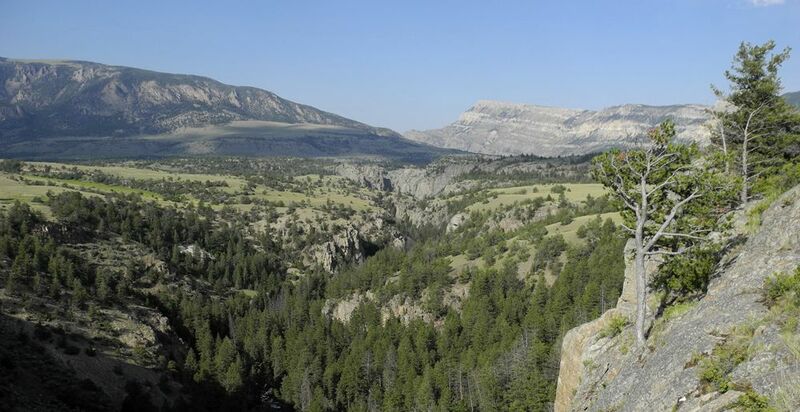 8,060', shows the climb (5 star), and panorama of the Absaroka Wilderness flanked by Sunlight Peak, elev. 11,922'. This is a textbook example of aerial perspective as taught to me by a brilliant artist and watercolorist. I'd had a long day so I again opted to credit card camp in Cody and luckily acquired one of the last remaining vacant rooms there, Sturgis was obviously calling the Hogs. After a steak dinner, brew therapy and short stroll I succumbed to the TV and mattress. Next morning I rode westward following the North Fork Shoshone River past Buffalo Bill Reservoir on US20 entering the park through its Eastern Entrance, one of my favorite rides ever! I stopped to photograph a tour boat as it sliced the surface of Yellowstone Lake near West Thumb. After a coffee and muffin break at Flagg Ranch Village Heidi and I motored on south into Grand Teton National Park stopping at Jackson Lake for a panorama. Heidi posed nicely for the obligatory tourist portrait in front of Grand Teton Peak, elev. 13,770'. 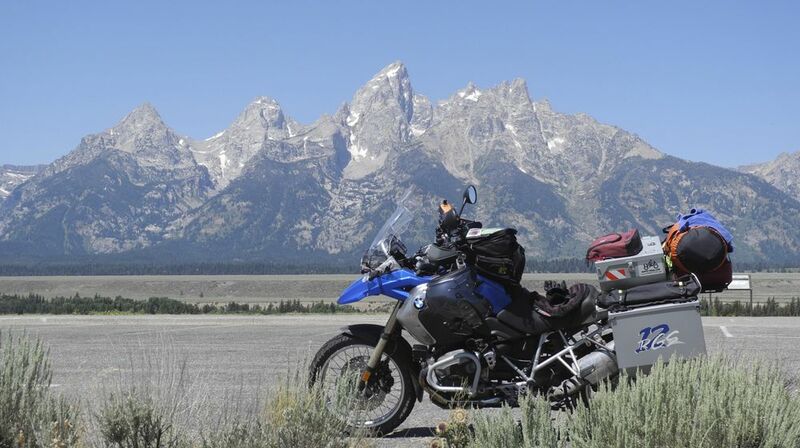 The magnificent panorama of the Tetons can't be equalled. 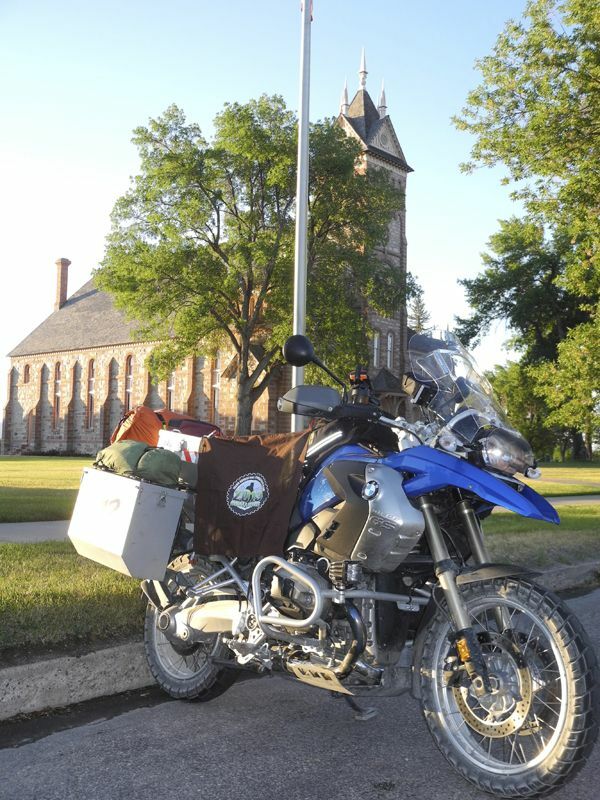 Back on task for the Challenge I motored on through Jackson for fuel then past Alpine and Palisades Reservoir on US26 to the junction with McCoy Creek Road and followed the GPS to Caribou City (#6). Only the remnants of a few log structures there but very good and easy riding. The road south to Soda Springs past Grays Lake NWR was very fine, some bird watching involved. It was all new to me. 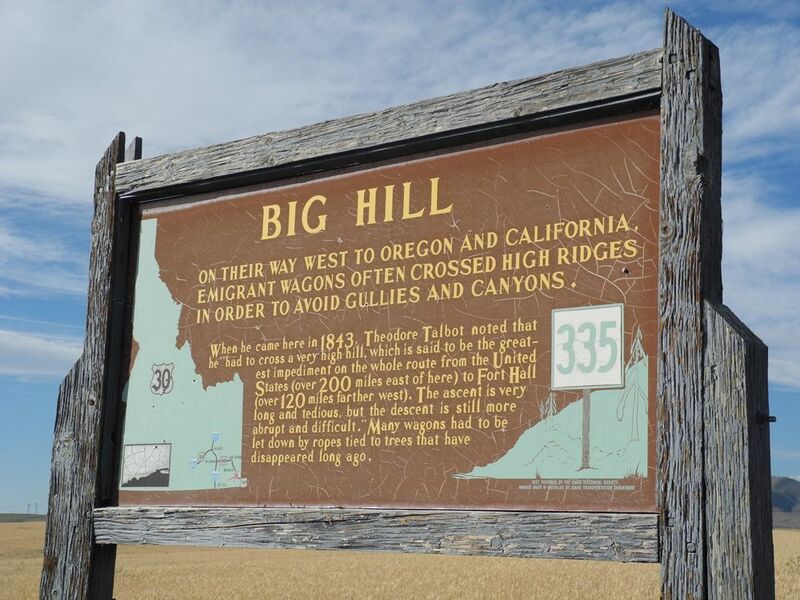 Rolling south of Montpelier was the Big Hill site (#17) and a lesson in Oregon Trail history. 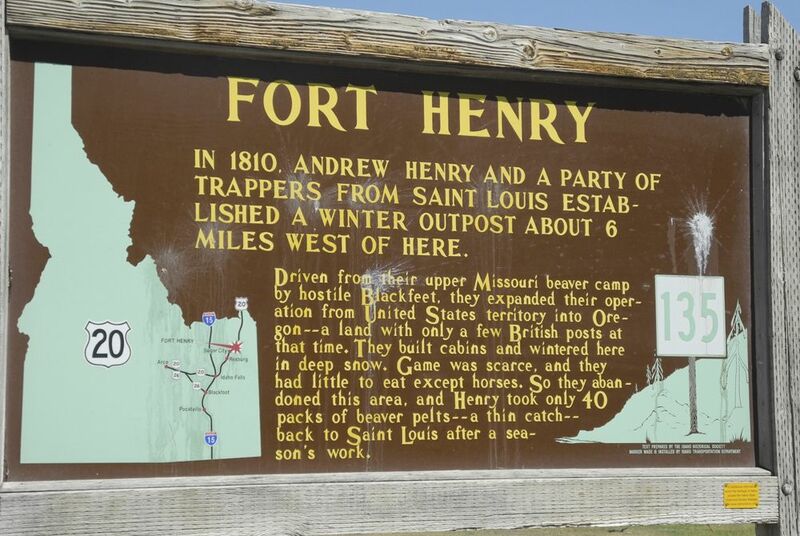 State historical marker #335 explains some of the hardships experienced here by those headed west. Look closely and you'll see that the wagon wheel ruts can still be seen descending the ridge. Historical marker #456 stories the Big Hill bypass constructed in 1852 that eventually became the route of US30. Tired and dirty Heidi and I limped back to Montpelier for our last night on the road. Next morning dawned clear and cold, the ride to Paris Tabernacle (#4) chilled me to the bone but Heidi waited patiently for me while I lingered for the warmth of the sun. 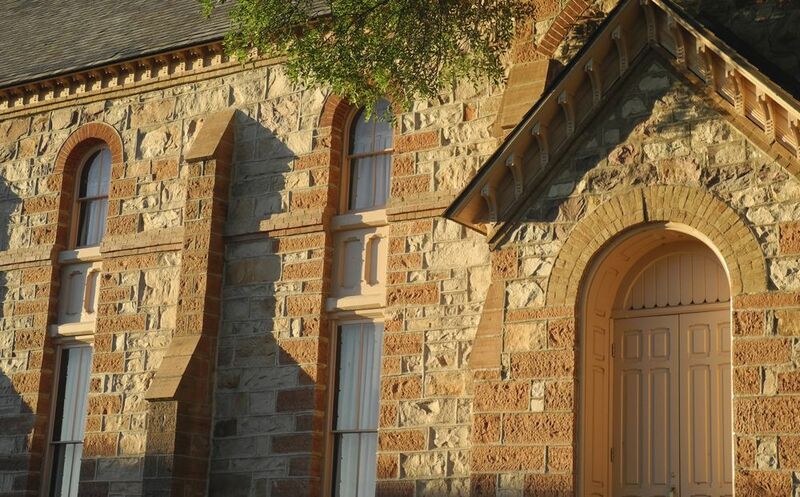 The architecture and craftsmanship of this tabernacle is impressive. 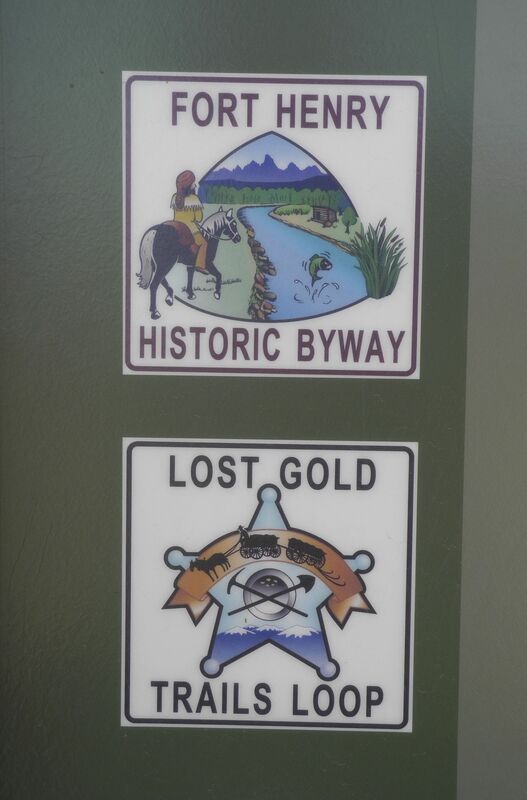 Having visited the Bear River Massacre site (#5) last summer for the BMW Club's 44 County Challenge I knew that it would be only a few miles north of Preston on US91. 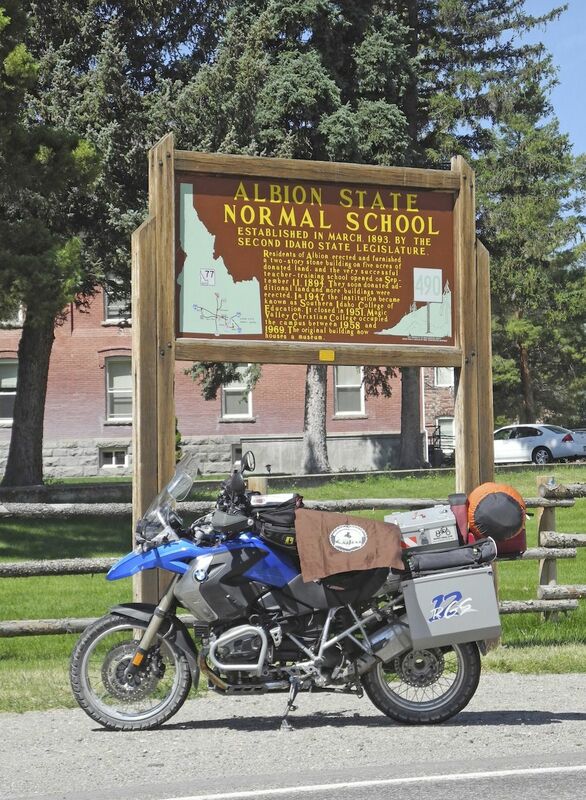 Challenge sites tagged, I wound through Malad City, Idaho; Snowville, Utah; Malta and Albion where I stopped to repeat the site photo at Albion Normal School (#30). I then pointed Heidi homeward trying to follow US30 and avoid the super-slab as much as possible. A stop in Twin Falls for fuel and lunch, then a cruise through Hagerman Valley, King Hill, Glenns Ferry and the back way to Mountain Home where I was again forced to join the zombies in their rolling coffins. GPS said 1,736 miles, ten challenge sites in five days, not bad, average under 350 miles per day. Heidi performed flawlessly, never missing a beat over nine summits, seven passes and one gap. 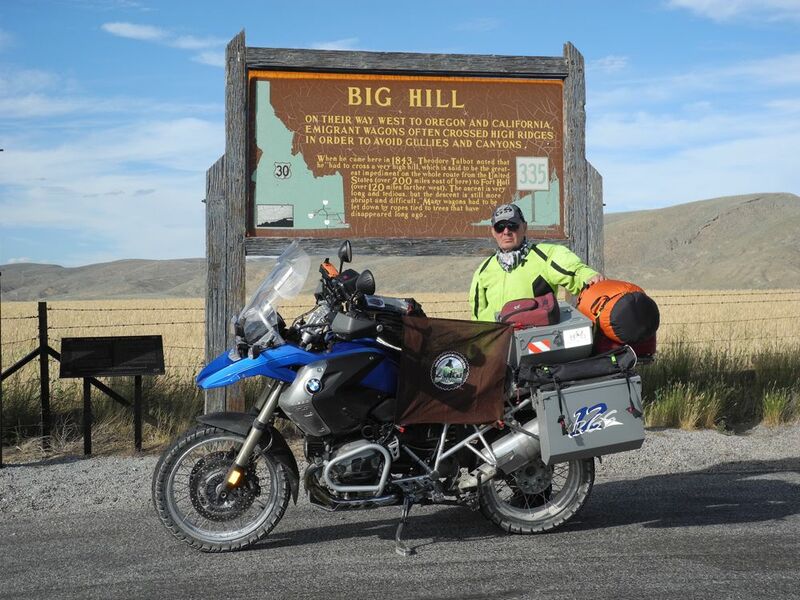 Thanks to Chuck and Fred at Big Twin BMW and for the Happy Trails crew for equipment that functioned flawlessly, thanks Ed and Tim. 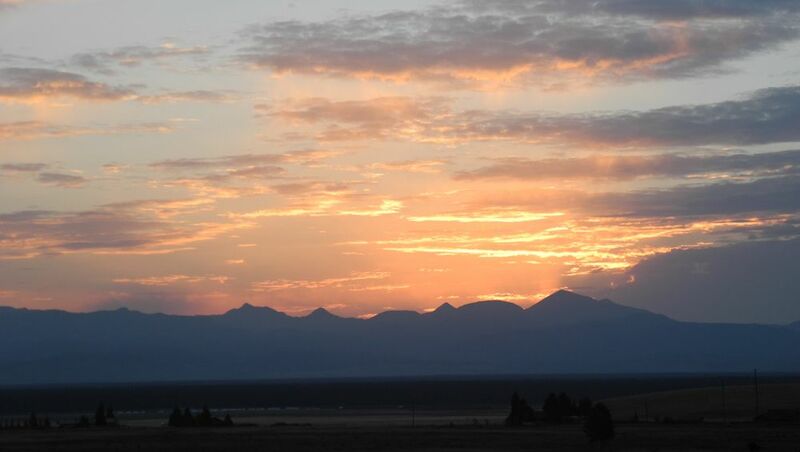 Once again the IAMC Challenge has proofed its promise to get us out and ridin' to the places we've rarely or never visited in this part of The Great American Northwest. Thank you for the chance.